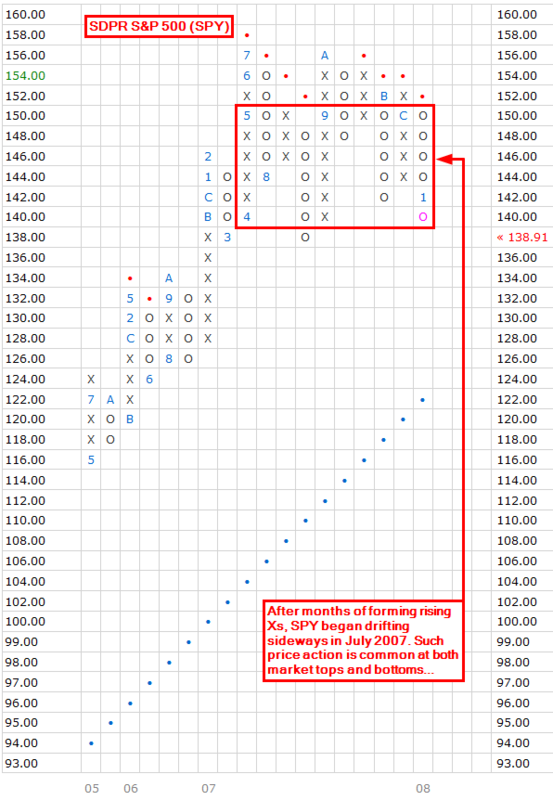 Late last year I posted an article on the basics of traditional Point and Figure trend lines. In it, I explained that bullish support lines are always drawn at rising 45° angles off of significant chart lows, and bearish resistance lines are always drawn at falling 45° angles off of significant chart highs. Given those rules, and the inherently “square” nature of Point and Figure charting, it stands to reason that 45° trend lines should be drawn on straight trajectories until they are violated by price. This, however, is not the case. Due to a frequently overlooked but very important rule pertaining to those lines, they may on occasion shift trajectories. In this brief article, I’ll explain that rule and provide several real-world charts that demonstrate its usage. In other words, as far as 45° trend lines are concerned, almost doesn’t count. Price may test a trend line by advancing or declining to it, but may only invalidate a line by moving at least one box beyond it. Considering this, and the fact that Point and Figure squares may only be occupied by a single X, a single O, or by a trend line, how do chartists represent both price and trend line when the two intersect? The simple (and often surprising) answer to that question is, they move the line. Let’s look at some examples. 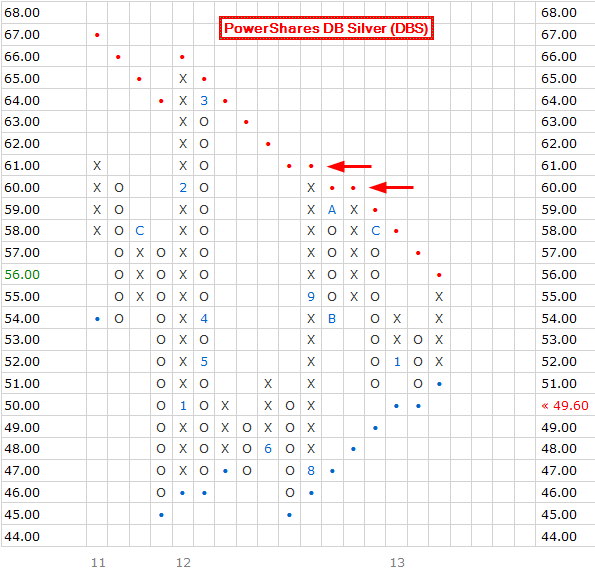 The chart below shows that PowerShares DB Silver (DBS) touched its bearish resistance line twice toward the end of 2012 but on both occasions failed to rise above it. The line was therefore never violated. However, to represent the fact that it was tested, it was in both instances shifted up one box (see red arrows), creating adjusted downward trajectories. 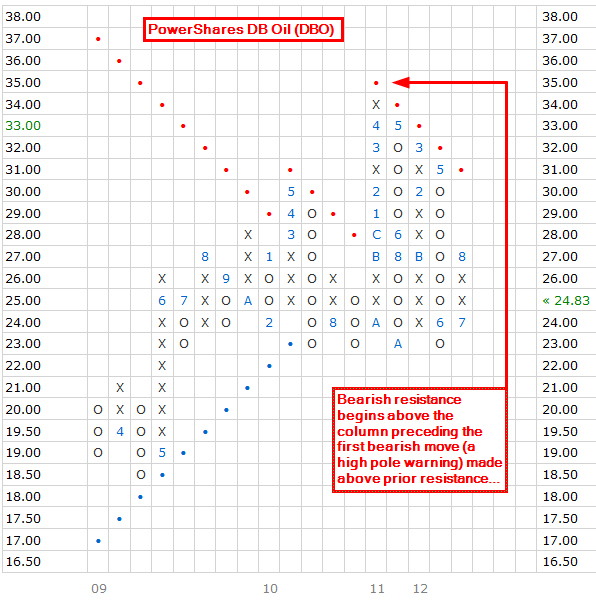 In similar fashion, DBS twice touched its bullish support line in early 2013 before dipping below it. On both occasions, the line was shifted down one box down, creating adjusted upward trajectories. When price finally did fall decisively below bullish support the following month, the portion of the trend line that had been shifted down to account for the second line test was removed and the trend line itself was terminated. 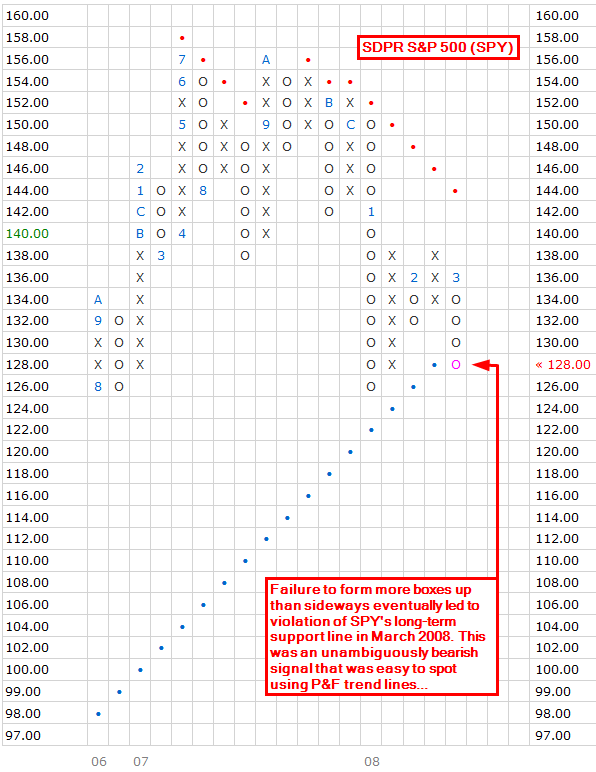 So, contrary to what many P&F newcomers often assume, traditional Point and Figure trend lines are not always drawn in straight lines. In order to visually account for situations in which price touches a trend line without violating it, those lines may be shifted up or down one box, creating new trajectories. The distinction between a failed trend line test and a successful trend line violation is a critical one. Understanding that distinction will help you avoid false trend line signals and keep you trading on the right side of the trend. It’s no secret that trend lines are an important facet of Point and Figure charting, key to evaluating long-term chart trends. However, while much has been written on how to draw and interpret these lines, much less has been said regarding the rationale behind the rigid fashion in which they’re drawn. I’m going to pay some service to that issue below. 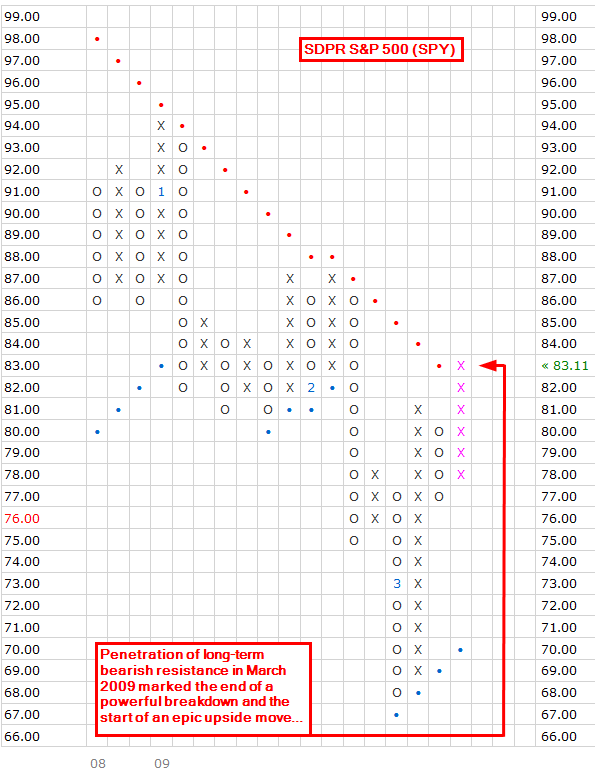 First though, let’s review the basics of P&F trend line creation. Whereas trend lines on bar and line charts are drawn subjectively, at the discretion of the chartist, traditional Point and Figure trend lines are drawn in an objective fashion, using simple but strict rules. Bullish support lines are always drawn at rising 45° angles off of significant chart lows, and bearish resistance lines are always drawn at falling 45° angles off of significant chart highs. 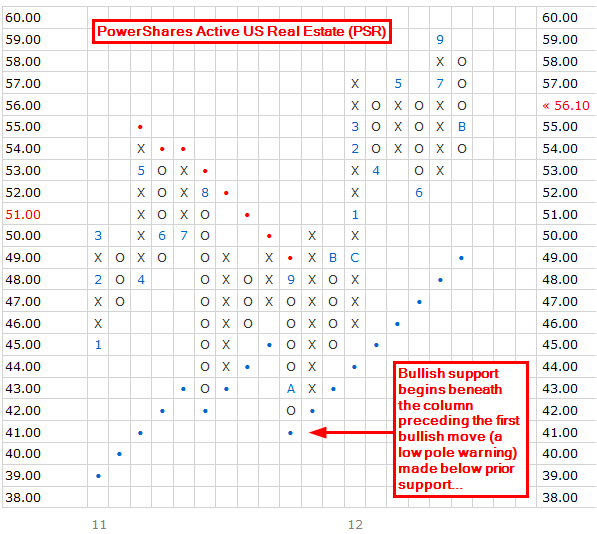 Charts priced above both bullish support and bearish resistance are assumed to be in strong uptrends. 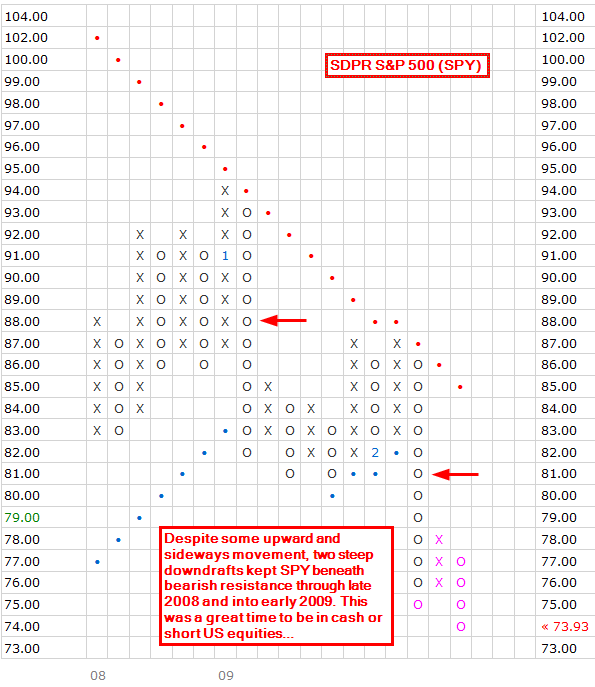 Similarly, charts priced below both bullish support and bearish resistance are assumed to be in strong downtrends. Violation of long-term bullish support is considered a bearish event, and violation of long-term bearish resistance is considered a bullish event. So far so good. Pretty simple stuff in principle really. But have you ever wondered why Point and Figure chartists are so intent on drawing these lines at fixed 45° angles, given the inherent inflexibility of that approach? If so, then consider the following. There are two key things to bear in mind here: one, such sideways patterns frequently surface at both market tops and market bottoms; two, when left unchecked, they eventually lead to 45° trend line violations. Why are these points key? Because, taken together, they imply that 45° trend line violations can provide advanced warning of important long-term trend reversals. That is precisely why Point and Figure chartists insist on drawing them, and why they pay them such heed! After drifting sideways and lower for roughly eight months, the chart above ultimately penetrated long-term bullish support in March of 2008, six months before the collapse of Lehman Brothers and the brutal bear market that ensued. So then, let’s review. 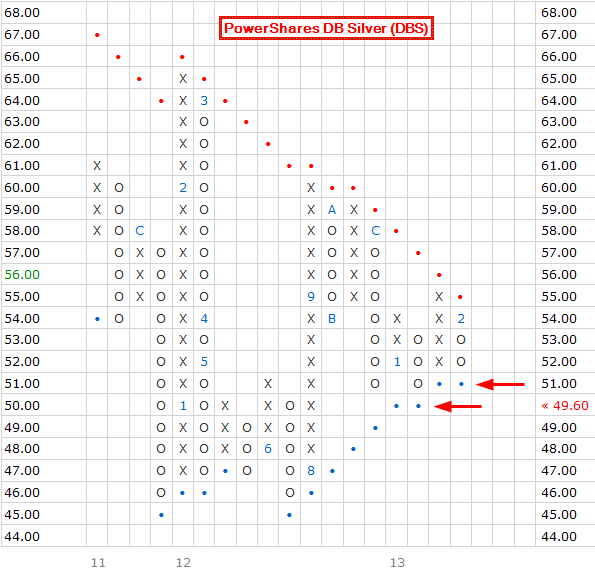 We’ve seen that Point and Figure trend lines are easy to draw and interpret. But that much has been noted many times before. The more subtle issue that we’ve examined is the rationale behind the rigid fashion in which these trend lines are drawn. To recap, due to the proportional nature of P&F charts, the manner in which chart squares form, and the implications and consequences of protracted sideways square formations, 45° trend lines are extremely adept at both verifying the direction of long-term trends and signaling important trend reversals. Remember, a primary rule of investing is to trade with the trend. To do that successfully, however, you need to distinguish bull trends from bear trends and recognize when trends are ending. 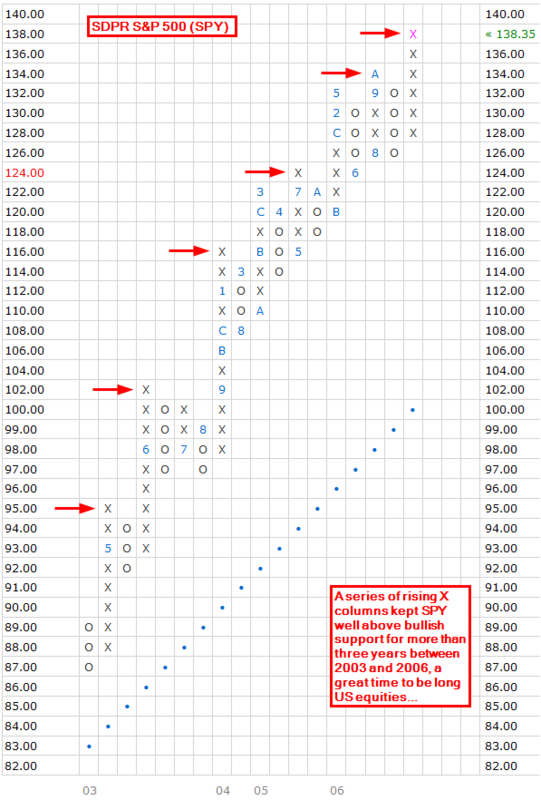 Traditional 45° P&F trend lines are very well suited to both of those tasks, and are thus rigorously utilized and highly valued by Point and Figure chartists.